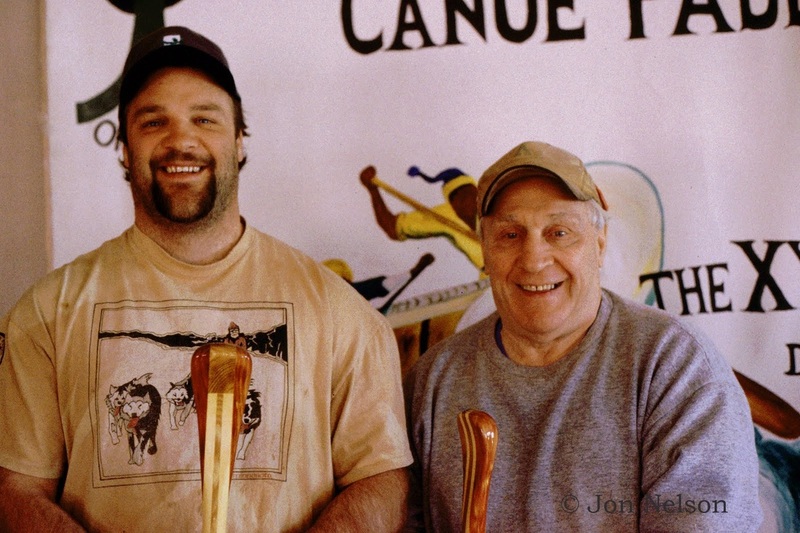 Don’s son, Spencer, grew up in Atikokan and canoed from an early age. He was an excellent hockey player and went to St. Lawrence University in New York on a hockey scholarship. He was drafted by the Buffalo Sabers in 1991 but decided to continue his college education and obtained a degree. He subsequently played pro hockey from 1994 until he was injured in 1998. He returned to Atikokan to learn his father's craft in 2000. He now works with his father and is the owner of the XY Company. Since returning to Atikokan, Spencer has become interested in marathon canoe racing. He has purchased a Hassle racing canoe and is now starting to race. Spencer is also crafting his own style canoe paddles. He has inherited his father’s experimental nature and is currently working on a paddle with a refined design that weighs under one pound. Meany paddles are now sold all over the world. They have filled orders from Malaysia, Serbia, France, Australia, England and a few African countries. The “Raid the North” adventure race held in Atikokan in June 2003, which had competitors from many countries, was won by a team from France. The prize for one section of the race, which went from the Pines on Pickerel Lake to the beach on French Lake, was won by a team from southern Ontario. The French team was so impressed with the XY paddles that were given as prizes for this section of the race, that they had Don and Spencer make four more of the paddles and had them sent to France. The Meanys have heard many stories regarding the use of their paddles. Spencer’s favourite is about the young couple that came in to purchase a set of XY paddles because they were passed on French Lake by an elderly couple using XY paddles who hailed them a good morning before rapidly vanishing into the distance. Many canoeists stop at their shop in Atikokan to buy paddles or simply talk about their canoe trip. Once you have stopped and heard the Meanys tell stories from, it is almost impossible to drive by the next time without stopping. Local historians and archaeologists do their best to make connections to people who lived on the land that is now the boundary waters of Ontario and Minnesota. These written connections to the past are usually not very successful in making the past seem vivid and alive. People who work with wood rather than words, such as the Meanys making paddles, are probably more successful in showing that the past can be materially expressed in a form that is still relevant and works effectively today. Gary Snyder, in his book Practice of the Wild, quoted a Crow elder. “You know, I think if people stay somewhere long enough – even white people – the spirits will begin to speak to them. It is the power of the spirits coming from the land. The spirits and the old powers aren’t lost, they just need people to be around long enough and the spirits will begin to influence them”. As much as anyone I know, Don Meany has been influenced by these spirits and he can effectively make the past seem compelling and alive. When he talks about voyageurs, canoe racing, changes in paddle design, or working in Quetico, the past and the present become effectively melded together. His is an animated oral history that allows you to feel a connection to the people and the traditions of those who came before us.